The heartland gushes. Highways like arteries. The map darkens with spreading red. At night, it’s all a great big bloody nowhere, a yawning mouth, a hungry shadow. And you have to cross it. It feels like a bad dream. It is a bad dream. This can’t be real. This can’t be what they want you to do. Of course, you know as soon as you wake up it doesn’t change anything. It doesn’t stop the fact that tomorrow night, this dream you’re having right now becomes really real, and let’s face it, you’re probably going to die out there. 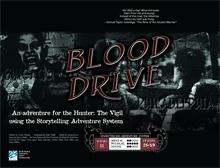 Blood Drive contains Storyteller character records, props, a number of hyperlinks to various portions of the text as well as bookmarks, so you can always jump right to what you need with just a click. It also has a new Benediction, a new Dread Power and a new Profession. 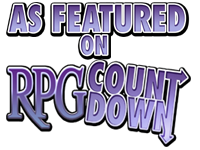 It is inspired by Night Stalkers, but that book is not required to use Blood Drive.